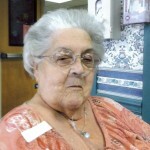 Morwenna R. ( Hawke) Briggs, Ann as she was known, passed into the loving arms of Jesus on March 17, 2013 at the Orchard Nursing Center where she resided the last four years. She was born to parents Percy and Irene Hawke in Devron, England on Jan. 25, 1927, one of nine children. Ann served the Women’s Land Army during the war in England. After meeting her future husband, who was serving in the Navy, she came to the United States and married Stanley B. Briggs in 1947. Ann was a homemaker, wife and mother. Besides her husband, she is predeceased by her son, Ronald Paul Briggs. Survivors are two daughters, Carol of Whitehall and Sandy of West Virginia, one sister, Anita Wilce, sisters-in-law Edie Hawke of England and Rita Huntington of Clemons; several grandchildren, great-grandchildren, nieces and nephews. Interment will be on Sunday, April 14, 2013 at the Clemons Cemetery at 1 p.m.
A get-together with be at 5 Queen Street following the service. The family would like to thank all at the Orchard who took care of Ann and came to be her family, she loved you all.